Life has just become that much sweeter as macarons have now become part of my daily routine. 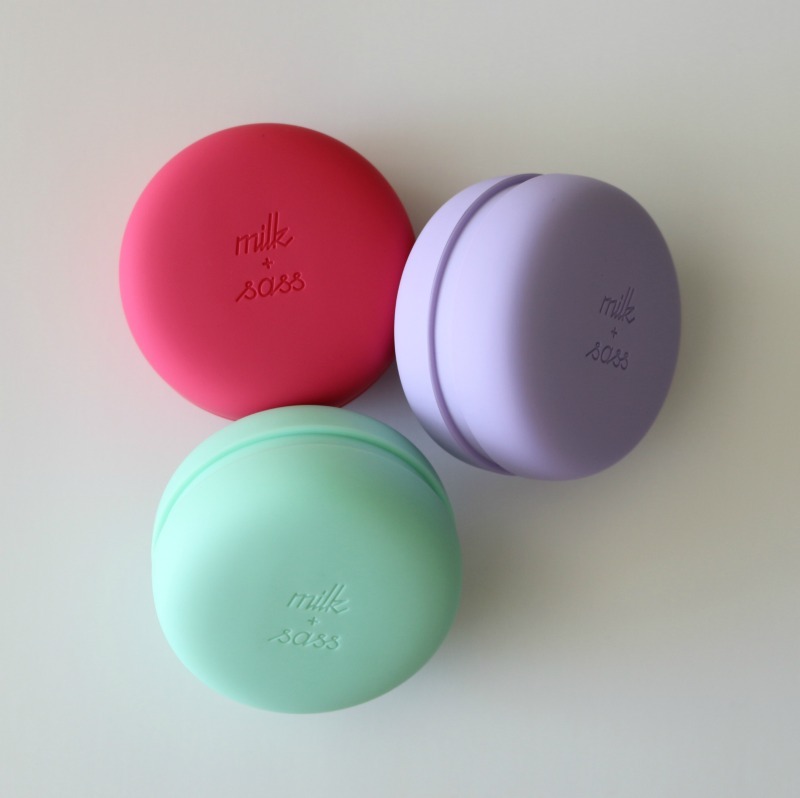 Not the edible kind however - allow me to introduce you to Milk + Sass Macaron For Hair*. These cleverly designed detangling hairbrushes are not only super adorable, but they are also convenient and get the job done without putting you through unnecessary pain - because if you also deal with hair prone to knotting and tangling, you know just what I'm talking about! 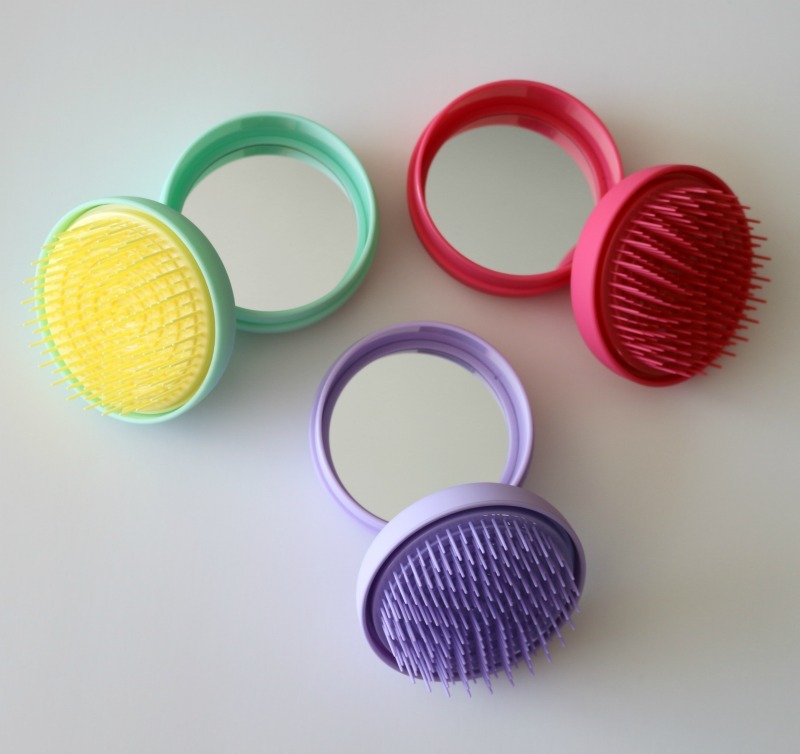 Not only does the Macaron For Hair come in a variety of bright colours, such as lavender, lemon pistachio and raspberry (seriously though, picking just one is no easy feat), but each compact also includes a mirror on the reverse side of the cover, making these perfect to take with you on the go while keeping the bristles protected. 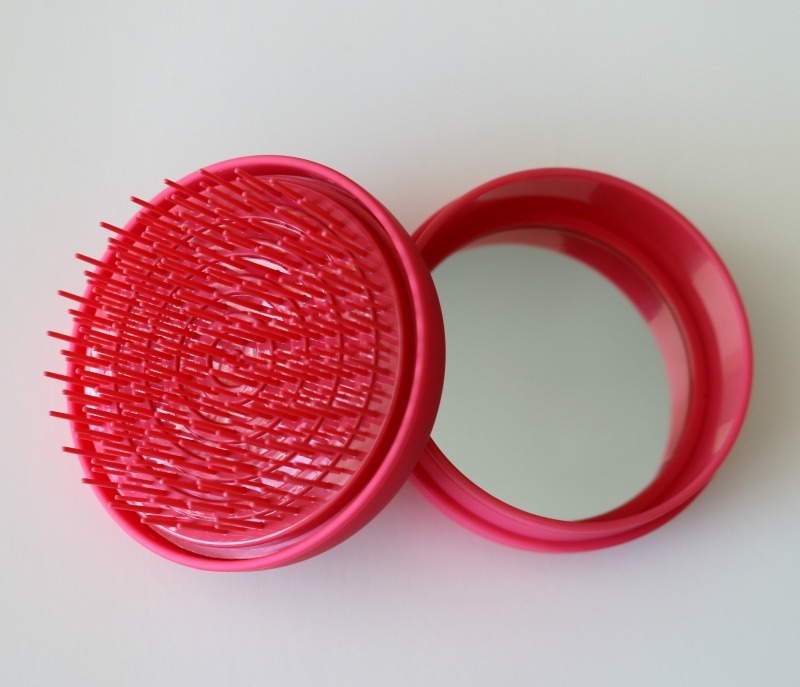 The two-length radial bristles are said to work twice as fast as the average hairbrush. 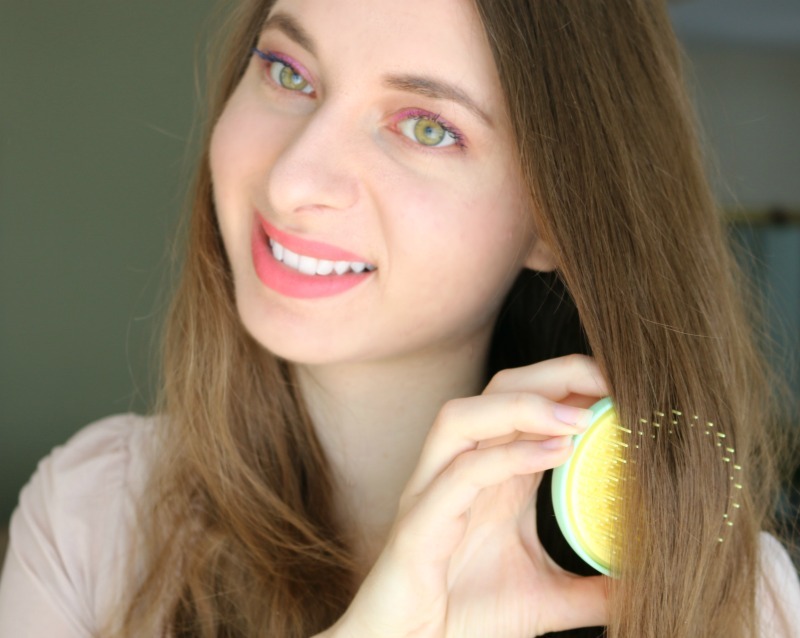 Whether you have just hopped out of the shower or are waking up with dry, messy hair, the Macaron For Hair will work its magic and have you looking like Rapunzel in no time. Did I mention that this hairbrush works on all hair types, even on extensions? Have long, thick and wavy hair like me, or short, thin fragile locks prone to breakage? The Macaron For Hair will have your hair looking fabulous without causing any damage. 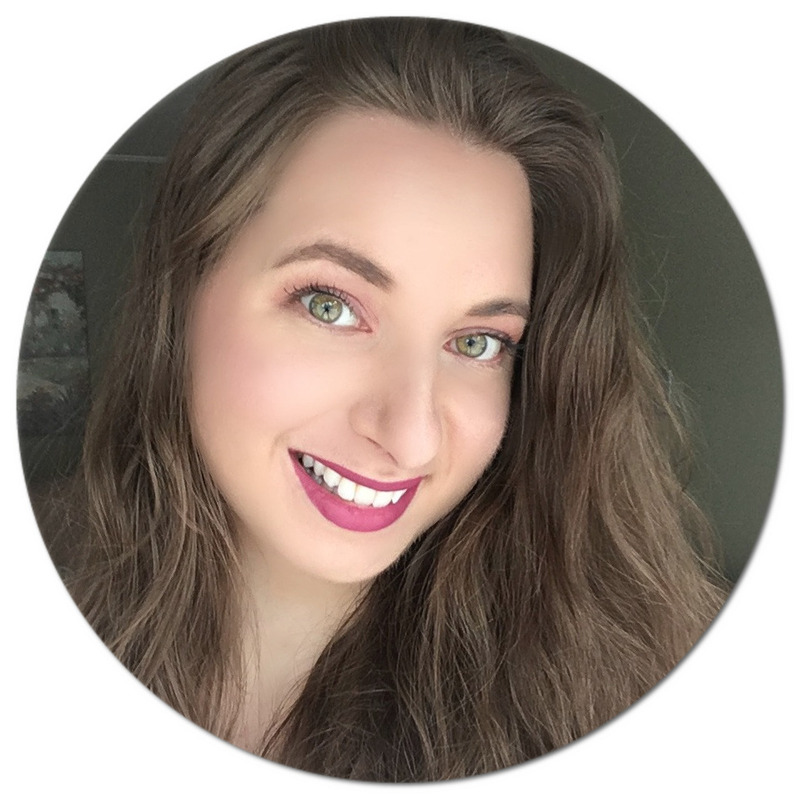 I pretty much ditched my regular hairbrush years ago and resorted to using a wide tooth comb, although it would still take me quite a while to get through all of my knots. The Macaron For Hair has performed even better than I expected, and now I get to keep one on my vanity and two in each of my handbags. This will be a great little hair companion for when I will be travelling too as it doesn't take much space and is lightweight. Can you tell I'm pretty much infatuated with these little (hair) sweets? 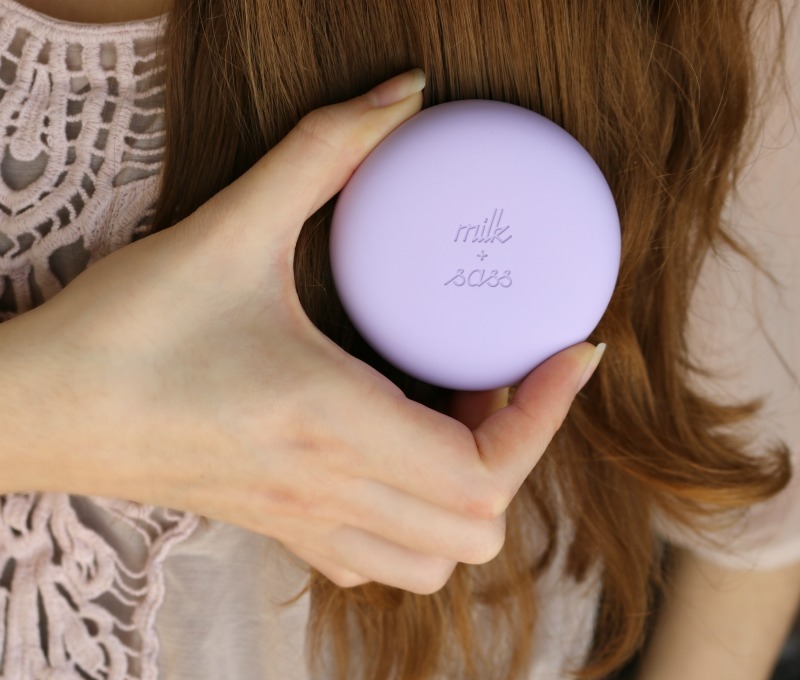 The Milk + Sass Macaron For Hair (US$15) is available in six shades and can be purchased online. Aren't these simply the cutest? What colour would you pick out for yourself? *Disclaimer: This is a sponsored post. Products were provided and reviewed in accordance with my Disclosure Policy. Neat! As a curly haired girl who finger brushes, I wouldn't use these; however, my oldest daughter has super straight hair that tangles the minute you're finished brushing it, and brushing her hair is always an ordeal. I may just have to give these a try! What a smart design. I might have to try one of these with my granddaughter's hair. She fights with tangles every day. I need to get this for my daughter. She has a terrible time with tangles. I love how cute and little this product is. It would fit great in a purse and I love that it comes with a mirror. My daughter needs one of these. Her hair gets so ratty from sleeping. I'd prolly pick the pink or mint! Those really are too cute. I'd love to get a couple for the grand daughters. They'd both love purple. Those look too cute! I love the rounds shape!! I bet they work well on tangles! Well that is the coolest thing! I do get terrible tangles even with my fine hair. I will be getting one of these! I have a feeling that these definitely wouldn't work with my super curly hair, but they look like they worked for you. I should keep one of these on hand for my daughters. They are always getting tangles in their hair on the go. Would be nice to have a compact brush that I could keep in my cargo shorts or messenger bag while out and about. Oh my, this is perfect for my daughter. She is fascinated with macaroons and has to use a detangling brush on her hair. Perfect! Oh this is an interesting product. I have been looking for a new brush that doesn't pull out my hair as much as mine does. I am going to have to check this brush out. I really want to try this out for my children! Their hair is so hard to manage. This looks like it will work for my super tender headed daughter:). I will be ordering one soon. I too just use a comb. I so need to try these as they look so much better. This is a really neat product! My hair is crazy and I hate brushing it but this looked like a product I could truly benefit from. I like the design and of course, the effective way it will help me tame my "morning head of hair." I will get one for myself and one for my daughter too. When she gets out of bed in the morning, it looks like she had a bout with fright night. LOL. That's cool. I have permed hair. I wonder if it would work well on my hair. I like how compact it is though. We have all boys in this house and I keep short hair because of those boys, haha! However, I truly enjoy the focus of this product! What a cute hairbrush! I want one of these even though I have super short hair and I only brush my hair once a day. that is sooo cute! 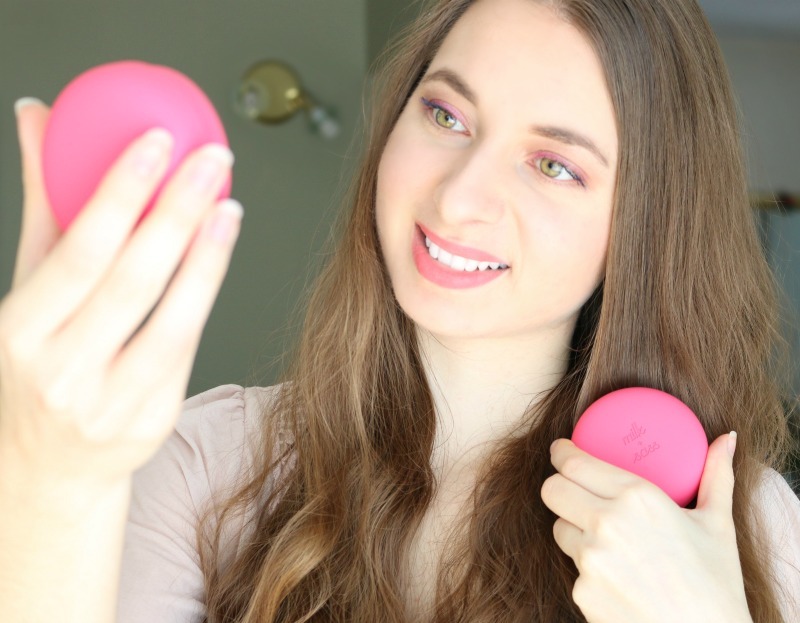 i love the idea of macaron, a brush and a mirror! that looks awesome! Hairbrushes are not a friend to my curly hair. However, my daughters and granddaughter might like these. The brushes come in a nice selection of colors, and with their size, the brushes will easily fit in a purse, bag, or pocket. Those are adorable. I'm not convinced that they would be able to withstand my super curly hair, but they certainly are cute. That's totally adorable! I would love the pink one and the blue for my niece! Gonna have to get a brush for my daughter and one for me. They look convenient to carry. What a handy thing. This is so interesting. And its cute also. Love to have one. These are so cute and come in so many cool colors. I can see the girls at my daughters school all going gaga over these things! The Milk and Sass Macaron For Hair sounds amazing. My hair is so thin and long that it get tangled easy and is hard to brush out sometimes. This brush would be awesome and I love how small it is so it can fit in my purse. Thanks for sharing this awesome tool. I love this kind of hair brush. So handy. And its cute. Its really good to those girls who loves beauty. These are so cute! I love all the color options. I have a short hair and would like to get this. I would love to try this! I love the fun, bright colors and that it is small enough to toss in your purse. This would be great for when I travel. This is a neat idea especially with the mirror. Being that we are all curly heads in this house, I probably wouldn't use it. These hairbrushes look awesome. I need one for my granddaughter. This brush looks fabulous! I think I need to pick one up. I love the colors too. I would prefer hair brush with handle but this design looks so cute. Reminds me of a shampoo brush I had when I was little. Those are too cute. I love the purple one and wish that I had one for my hair. It is the perfect size to keep in your purse too. Now this is a neat idea! I love that purple one and bet my daughter would too. We are always losing Hair stuff though. It's a plague. This is a wonderful idea. I would certainly like to try this on my hair as well as my daughters. I should try this on my son's hair. I have the hardest time untangling his hair. I have to try this with my daughter. She has really tangled hair. I like this! These are neat! I will have to tell my niece about this! That's awesome that it works even on hair extensions. I like the look of them too. How cool is this?! I wish we'd have had it when my daughter was little. Oh my goodness the days of trying to get through her thick wavy hair! I'll have to show this to my friend her daughter has curly hair and never lets her brush it ha ha. I don't really use brushes in my hair anymore. When I used to, I would have loved this tool! These are all looks cute and I love all the colors. I want to get this one. I could really use on of these because my hair tangles so much during the night. They are so cute, I love the bright colors. Those are perhaps the cutest hairbrushes that I've ever seen! And I love that it has a mirror too. I'll get the red! My hair is always getting tangles and these are just so gorgeous! I love the colours and the mirror in the lid is super useful too! Well, first of all, this is the cutest little thing! Second of all, very interesting - I certainly would try it! Especially for only $15! This is what my daughter need for her long hair. She hates it ion the morning coz her hair is always tangled up. This sounds fab! Me and my daughters could really benefit from using this so will definatly be getting 1 or 2! These look amazing! I could use this for my daughter. She is super sensitive and always has tangles! Very cute compact. Love the fact that it includes a mirror and brush. I love this kind of hair brush. Very handy and cute. I like it! I love how compact they are. I never carry a brush since they take up too much space, but this takes care of the brush AND a mirror. I'm already intrigued and I want to try this! I feel it will simplify my hair care. This sounds like every girls dream especially if you wake up with bed head.